Romanian Farmers from Transilvania will be recognized during PRIA Agriculture Conference & PRIA Romanian Farmers Awards, that will take palce on June 14th 2018, at Grand Hotel napoca, Viena Hall, starting wit 9.30. Conferința PRIA Agriculture și Gala Fermierilor Români din Transilvania is one of the most important events for agriculture and represents a real platform of debate between farmers, associations, central and local authorities. During PRIA – Romanian Farmers Awards Gala, we will recognize the efforts and the contribution of Romanian farmers who have invested financial resources, hard work and experience over time, contributed to the development or maintenance of Romanian agriculture to have a good place in the EU. We will recognize the efforts and the contribution of the Romanian farmers that invested Romanian capital, time, labor, knowledge and energy to Romanian agriculture – crucial engine of the Romanian economy. We will also recognize the merits of researchers and those who have helped maintain our agriculture. The agriculture is vital for the whole world. EU allocates a big budget and a special attention for this sector. This is why the Common Agricultural Politics consolidates the competitiveness and sustainability for the agriculture in EU by granting direct payments of farmers, market measures and financing programs for the development of rural areas in the Union. Because the agricultural sector is extremely important and because the Romanian farmers have done much for Romania’s agriculture, at the PRIA Agriculture conference we will award and applaud the activity, the energy, the work done and the patience of them. We will also find out what challenges they are facing and why they need to grow their businesses, but also what their success stories are. 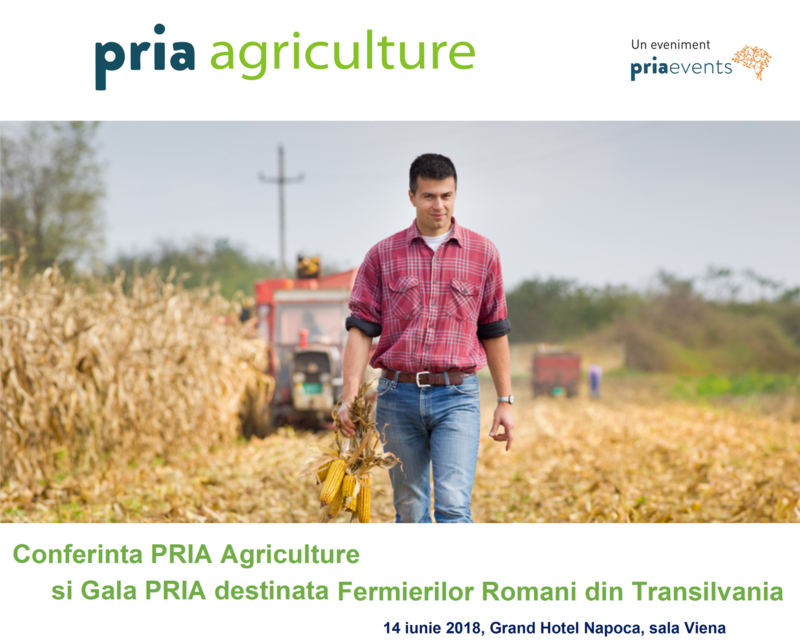 At the second edition in Romania, through PRIA Gala Romanian Farmers, we will highlight and make people aware of the role and role of Romanian farmers in the development of agriculture in our country. Through PRIA Gala Romanian Farmers, we will highlight and make people aware of the role and role of Romanian farmers in the development of agriculture in our country. 10.00 – 12.00 – Round table – How do we increase Romania’s agriculture and encourage Romanian farmers? The priorities and the Strategy of the Romanian Government regarding Romania’s agriculture. How will this look on the long run? How to apply the stipulations of the Common Agricultural Policy (CAP) and Common Fisheries Policy? What improvements could be made to PNDR? What proposals do farmers have? How does the long-term strategy should look for Romanian Agri-Food? Simplifying procedures of APIA and AFIR agencies. How do we increase the growing absorption of European funds? Irrigation systems in Romania. Can natural water reservoirs be a solution? In what stage is the cadaster – the 2018 is mandatory for obtaining subsidies. What is the role of the Ministry of Development? Creating of the mutual fund – when will it enter into force and what risks will it cover? Agricultural chambers – how can they be organized and when? What challenges do the Romanian farmers face in agriculture? Why do they need to grow their businesses? How do we increase the absorption of European funds? How can banks, leasing companies and guarantee funds help increase the absorption of EU funds? What is the role of investment funds for agriculture? National cadaster. How should the land fund law look like? Since when will the identification and delimitation of all mandatory agricultural parcels be based on cadastral data? What should be changed to the law that liberalized the land market? What are their success stories? How they learned to do business and how they can share their experience? What advices they have for those who want to start a business in the agricultural sector? Fiscal measures for agriculture – compensation of subsidies. How should the relations between farmers be established and those who give land on lease, which are the obligations on VAT? Irrigation – vital for agriculture. The state of implementation of the law on irrigation. What can Romania do to solve the problem of irrigation? The balance of 2017 and 2017, and solutions to have a better agriculture in 2018.